Durham Tamil Association was proud to present the 12th Annual Youth Festival ,featuring a colourful entertainment for all our guests.From the blooming artistic superstars to the talented youth of Durham’s Tamil community, everyone got an opportunity to showcase their talent.It was manifested on the 23rd November 2013 at Pickering High School, and the program was a great success as we had 139 kids and youth partaking in this extravaganza program.Dressed in vibrant colourful traditional Half Saree and Dhothi, our Youth welcomed the dignitaries, guests and parents. The curtain raised with the National Anthem of Canada played on the Keyboard by Krishanth Kirupananthan, student of Mr. Ajithkumar Vettivel of Manon’s Music Academy. This was followed by the Tamil Thai Vaazhthu crooned loud and proud by Asvin Sathiyalingam and Suvetha Sathiyalingam who are the students of Mrs.Manorani Thusitharan. The Eminent Dignitaries including MP Corneliu Chisu,MPP Joe Dickson,Ajax Mayor Steve Parish,Councillor Renrick Ashby (Ajax),Councillor Peter Rodrigues (Pickering), KimDowds representing Hon.Minister Chris Alexander, Martyn Beckett- Director of Education(DDSB), Hermia Corbette - Welcome Centre Manager(Ajax), Sophia Bittar Community Liaison of Welcome Centre, Esther Enyolu - Executive Director of WMRCC, Shivana Choonsingh & Fanuel Ephrain from WMRCC, Neethan Shan President,Ontario NDP,Juanita Nathan - York Region District School Board, Kelly Boehm - Education Officer/Staff Development(DDSB), Robbie Prochilo - Community Recreation Coordinator from Town of Ajax, Cheryl Johnston - Senior Communications Advisor of OPG, Peter Bradshaw - Executive Assistant to MP Corneliu Chisu, Kiruba Thuraiappa - President of Brampton Tamil Association, Yan Fu & Michael Crowley of DACA,Vaqar Raees - President of Friends Indeed, Saeed Siddiqui - VP of friends Indeed, Sudarshan Meenakshisundaram - President of Tamilnadu Cultural Society of Canada, Augustine Jeevanantham - Manager of SSN and Meccana Ali of SSN attended the event. MP Corneliu Chisu, MPP Joe Dickson, Councillor Peter Rodrigues, Councillor Renrick Ashby and Kim Dowds were honourably invited to the stage for the ceremonial lighting of the inaugural lamp.A moment of silence was observed for all Tamils who lost their lives in SriLankan war and at the recent typhoon in Philippines. Ms.Vaishnavy Muraleetharan a vivacious member of DTA Team Youth was the Master of Ceremony and she did an outstanding job of attracting a great deal of attention and praise into the event.The event was kick started by “Vaathiya Bruntha”. Trained by “Isai Kalaimani” Mrs. Thulasi Ragunathan, students of Bruntalaya School of South Asian Violin played this remix fusion of Classical music and western blend expressing an emotional state in an aesthetic unity among the crowd. It was greatly appreciated and applauded as there were instruments like violin, Mridangam, Veena along with keyboard and drums. President Josh Suresh recognized the chief guest and invited few of the dignitaries to give a speech. A 24 hour Multi Cultural Bandathon was initiated by Durham Tamil Association in support of The Rouge Valley Health System Foundation in September 2013. DTA raised and donated $5000 dollars cheque and bestowed it to the Mayor of Ajax Steve Parish & Mary Slavik, Director of planned giving from Rouge Valley Foundation.It was truly a great moment for the Executive Team and members of DTA.Funds raised will go to Rouge Valley Health System Foundation to purchase a new operating room procedure table for cancer surgery at the Ajax Hospital. Followed by the Welcome speech ,President Josh Suresh reiterated that the main uniqueness of this program is for kids from diverse backgrounds can showcase and use their interests, talents and creativity to promote worthy causes, project a positive youth image and profile young role-models and to make a difference in the Durham Tamil community. DTA acknowledged the six of our youth members who excelled not only in arts, dance and music rather in their academics and have entered into the University with high score marks. Banuja Ganesalingam, Mathav Muhunthan, Naveen Sivakumaran, Prashan Rajaratham, Anith Sriranjan and Janan Ragavan were appreciated by Ajax Mayor Steve Parish with cash gift cards and souvenirs. “Welcome Dance” was performed by the students of Bharathalaya Dance Academy ,which was simply breathtaking and this was choreographed by our long standing member and young Guru ‘Natiya Kalaimani’ Ms.Nivedha Ramalingam. Sensation” by Ms.Sahana Nirmayan.She swept the hearts of all the members by singing the song “Nenjukulle” from the film Kadal. “Abinayam” was another classical performance by our member students of Sai Niruthya Dance School,Guru being “Natya Kalaimani” Bharatha Kalaa Vithakar” Mrs. Sujee Nisankan.Students performed for the song that illustrated Lord Krishna’s Kaalinga Narthanam. Mrs.Uma Suresh, our Program Coordinator recognized all the parent volunteers who assisted in the logistics of the youth festival, food, make up and practices of the kids. Even a small help makes a huge difference in a social service. “Fusion Steps” a filmatic duet dance for fast numbers from the songs Google Google and Oda Oda ,was choreographed by Mrs.Hema Karthik.Assisted by Mr.Karthik Gopal and Mrs.Komathy Ram ,it was appreciated for the uniformity and wonderful dress code that attracted all the viewers. “Mann Vaasanai” group dance choreographed by Mrs.Uma Suresh was a great applaud for it’s foot tapping dance. Dr.Vijayalakshmi Navaneetha Krishnan’s song Thottu Kadai Orathile brought the original flavour of the ancient folklore and was massively appreciated. Joshua Francis took away the audience by singing 21 Guns by Green Day while his brother Jeremy Francis played the lead electric guitar. “Fashion Vibes” ,a petite parade of fashion show for small kids,who were dressed in their best.Choreographed by Mrs.Uma Suresh and assisted by our youth Ms.Abishna Jayasundararajah, the kids took the Ramp for the Remo song from the movie Anniyan. “Vinnai Thodalam” was a heart touching performance by Krishan Thananjeyan, an autistic child who earned a standing ovation for his outstanding violin performance. This youth learned vocal and violin by himself glancing through the YouTube and other music CDs. Every child is bestowed with the talent all parents need to explore them by knowing what’s best for their loved ones. “Shruthilayam” showcased the talents of two groups of young emerging vocal artists who are students of Amirtha Gaana Mandram, Guru being Isaikalaimani” “Sangeetha Vithakar” Mrs.Manorani Thusitharan.“Kollywood Twisters” was another mind blowing performance choreographed by our Executive Committee member Mrs.Deepa Sivasangar. The young performers danced to the prayer song from the latest hit Idharkku Thaane Aasaipattai Baalakumara. Another emerging singer of DTA is Ms.Suruthe Janakan who mesmerized the crowd by singing “Mukundha Mukundha”. “Cloud 9” was another vibrant performance by DTA’s energetic youth boys,who danced for a hip hop number choreographed by Michael Tam depicting the talents and strength of “Tamil Pasanga”. The steps were foot tapping and enjoyed by everyone. DTA celebrated Halloween at OPG's information centre on Sunday Oct. 27th. About 50 kids dressed up for this special function accompanied by their parents and family members. The information centre looked spooky and scary orchestrated by DTA youths. The kids and youths enjoyed snacks, cup cakes, chips after watching a scary movie. DTA youths coordinated a number of games for the kids to enjoy. All in all it was a spooky Halloween enjoyed by all ages. 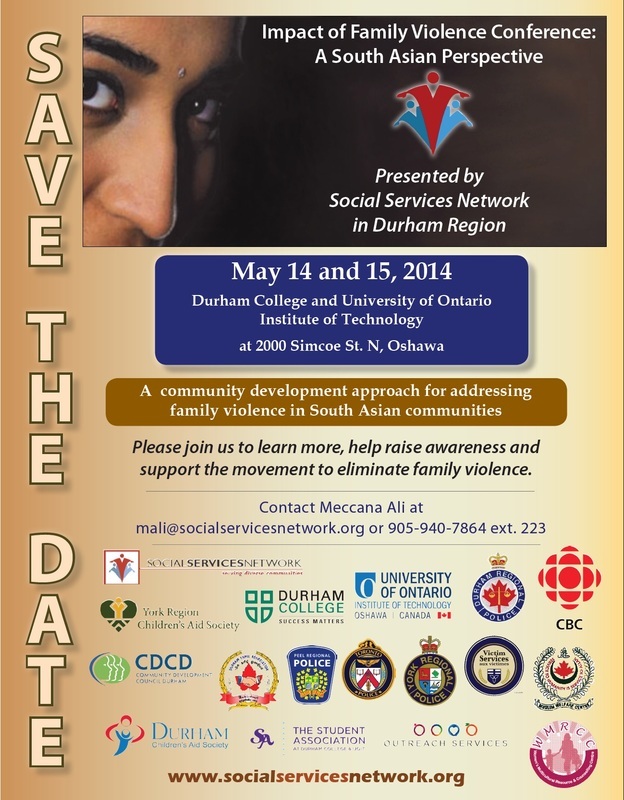 Special thanks goes out to DTA youths for organizing the event and OPG for providing a great venue. An outdoor Fall Family Festival was hosted by the Pickering Village on September 14th 2013 from 9 am to 7 pm. There were Farmer & Artisan Markets, live music and entertainment, activities and demo for families, live animals, teddy bear picnic, international food & tons more. Durham Tamil Association with 18 youth volunteers offered free henna, rice art, set up cubicles in the most South Asian traditional way. Ajax Mayor Steve Parish and MPP Joe Dickson were overwhelmed by the continual service provided by the youth volunteers of Durham Tamil Association. TEAM DTA Youth were involved with the setup, maintenance and clean-up activities in shifts, during this great event of Chocolate Margaret which brought the community together under one roof. It was quiet a proud moment for Durham Tamil Association when Canadian Cancer Society invited Uma Suresh to attend the Volunteer Leadership Conference “Celebrating the Power of One” .The conference was held at Innisfil on October 6, 2013 from 8:30am to 3:30pm. This was designed to enhance Leadership skills and help deliver better quality events. The highlight of the conference was to recognize the outstanding volunteers and to let them know that their passion and dedication for the Society has not gone unnoticed. The guests celebrated and appreciated the volunteers for their individuality. The fund raising initiatives and efforts of DTA and its youth was greatly appreciated by all. Engaging and interactive breakout sessions, Fire-side chat and motivational speakers made the seminar a memorable one. Durham Tamil Association came forward to help raise funds for the Canadian Cancer Society in their annual initiative "Taking Steps Against Breast Cancer" .This day program took place in Heydenshore Pavilion in Whitby,on Sunday from 10 am. 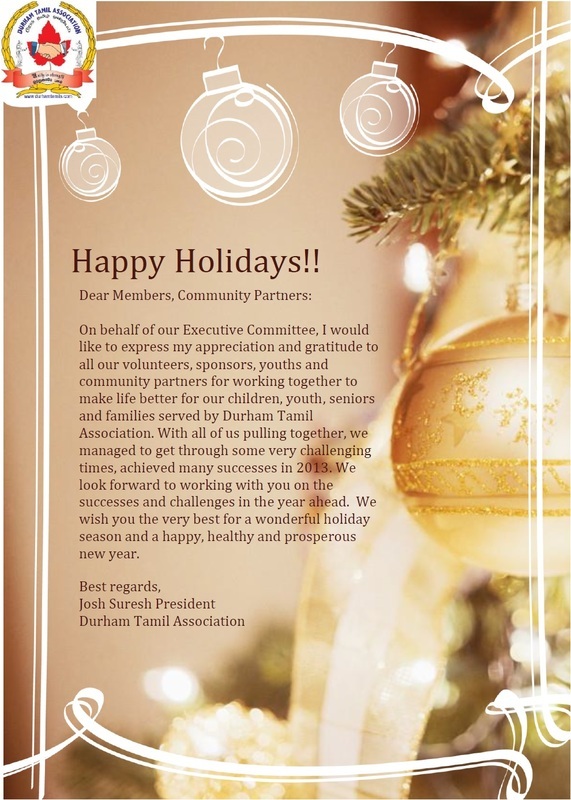 Durham Tamil Association was requested to take part and assist the team in fundraising. A team of youth volunteers along with Uma Suresh and Dujavanthi Swis filled the guests hearts with immense joy by decorating their hands and nails with henna and nail art. Mayor of Whitby Pat Perkins, Councillor Lorne Coe and Councillor Ken Montague appreciated DTA's efforts and commitment to help the community. Durham Tamil Association wished 146th Happy Birthday to our beautiful Canada in the most spectacular manner in both destinations of Durham Rotary Park – Ajax and at Kinsmen Park – Pickering on 1st July 2013 . DTA had a traditional booth set up by our enthusiastic youth volunteers in the most prominent location of the park and was well appreciated by the guest as it depicted the value and culture of Tamils. Our youth volunteers partook in this celebration by applying temporary tattoos for kid, handing out candies, Canada flags and pins for all guests who visited our booth with joy and love. Henna was beautifully applied for the guests by Ms.Ashley Kugaraj, Ms.Geeththanah Gnaneswaran and Ms. Luxsiya Kanthavanam in Ajax. In Pickering, Mrs. Dujavanthi Shwetsweare, Mrs. Uma Suresh, Ms. Thiviyaa Jeyaruban applied Henna for the guests. One of the eye-catcher of the event was our kids' colorful performances during this special occasion. The classical Bharathanatyam was showcased by the students and members of Kalainatiyalaya Dance School taught by Mrs. Kalaimathy Vakesan. Traditional folk art Karagattam was performed by Harini Kirupatharan, Bhaviyaa Jeyaruban and Saranya Suresh and this dance choreographed by our youth Ms.Maenusha Raguvaran. We also had the semi folk dance by our young and vibrant artist Maanusha Vijaykumar. Our Master Of Ceremony was our energetic Secretary Mano Pancharatnam who took the audience by his humor. Our program was applauded by the crowd as it had vibrant colors and spread the wonderful message of our Tamil culture to all Canadians. Durham Tamil Association was honoured in joining hands with Ontario Shores Centre for Mental Health Sciences for the Multiculturalism Day on the 21st June 2013. 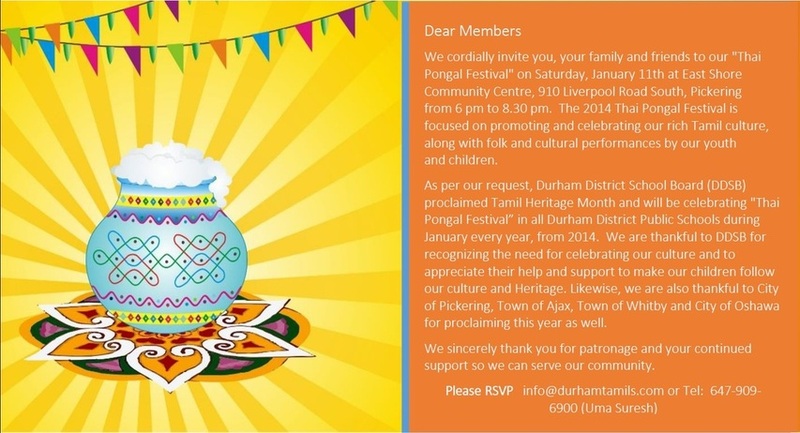 Various Nationalities of Durham community were represented and DTA showcased Tamil culture. We also helped the organiser to connect with various community group as Afghan Council of Durham, Friends Indeed (Pakistan), Devi Mandir(Guyanese) WMRCC DACA (Chinese Community) and ICCAD (India). Durham Tamil Association set up a traditional booth showcasing Tamil culture which was prepared by our youth volunteers. We also decorated hundreds of guests who participated in the event with free Henna and gave out Rice Art as gift and were appreciated for our service. Durham Tamil Association gave delicious traditional food like vada and samosa to all the guests. The Pickering Jazz Festival had been held at the Pickering Village for the past 10 years. This year, DTA played a key role from 6th – 9th of June 2013. The 4 days and nights of music and entertainment at the Pickering Village was a real treat for the community as it had music from near and far. Enjoying a weekend of music and sharing in our little community. The Music is the focal point but JAZ is more than that. It’s something that local residents have come to look forward to over the years. They came to listen, dance in the streets and enjoy some sumptuous food. The program flagged off with DTA's brand new Pinnacle Band, consisting of Jeremy Francis and Joshua Francis. This young musicians entertained the crowd in full stretch. DTA's proud icon Ms.Sarika Navanathan's melodious Tamil song accompanied by another dancing icon Ms. Maenusha Raguvarnan was a true treat to the audience. The event would not have been complete without DTA’s charismatic performances brought out by the amazing talented choreographer Mrs. Deepa Sivasangar. Young girls dressed perfectly like belly dancers not only proved their dancing prowess, but also made the audience dance to the step by tapping along with their young partners. Durham Tamil Association not only participated in the event but also assisted in the community cleanup activities. Youth volunteers got together to clean and improve public spaces during the four day musical celebration. It is a great social benefit as it creates more vibrant, healthy, safe, and sustainable communities. DTA always instructs the youth to involve in these kind of activity as they will acquire the skills and knowledge while working with the community. This also increase their social connectivity. Council of Agencies Serving South Asians (CASSA) held its Second Annual “Toronto Mela” on the 7 th of September 2013 at Albert Campbell Square (located outside Scarborough Town Centre). Durham Tamil Association pompously participated in the Mela as it is an effort to meet and gather with the South Asian communities to enjoy the cultural diversity in Toronto. DTA's Nivedha Ramalingam stormed the stage with her young students' classical Bharathanatyam performance. Three little dancers Athusga Kiriparan, Mabeena Piraba and Sharuka Thirumal brought fame to Bharathalaya Dance Academy by their outstanding performance. DTA revel the wonderful event by launching the day with youth volunteers fixed to setting up of booths for all the vendors partaking in the Mela. All the 34 youth volunteers of Durham Tamil Association had enormous assigned task on the event like guiding the performers to their respective venue, promoting the event by handing out flyers ,services and freebies to all the attendees, entertaining the kids with fun games and activities such as bouncing castles, basketball challenges and free gifts. Above all, the youth volunteers gave a big hand by continuously collecting the litter and hauling junk out on this huge event. DTA took pride by helping to keep the venue clean and also cleaving down the cubicle after the event. MPPs and dignitaries including MPP Corneliu Chisu and Minister/MPP Tracy MacCharles and organiser Neethan Shan honoured and recognized the youth of Durham Tamil Association for their outstanding Volunteer work within the community. 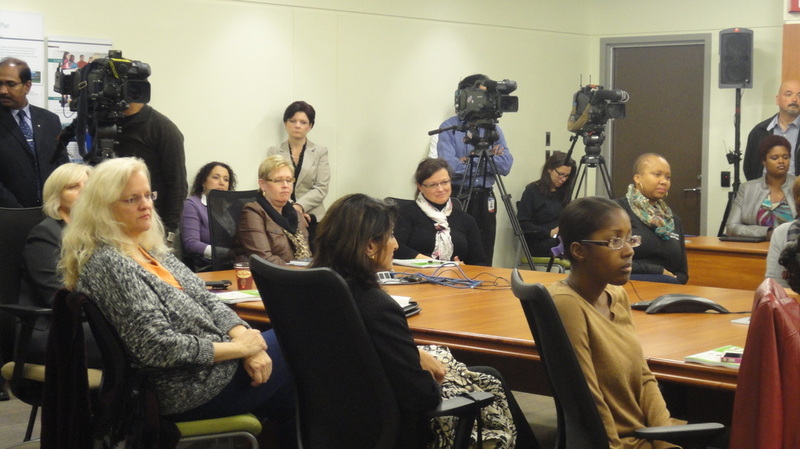 Picture above: Media Launch of the conference about family violence against South Asian Women.